Attending a powwow gives spectators the opportunity to glance into the history of Native Americans, a glimpse of a centuries-old tradition and a chance to gaze upon the beauty of their regalia while listening to the rhythmic beat of their drums and their voices lifted in song. 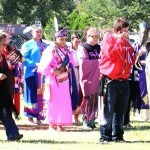 Everyone is welcome to attend the powwow at the Medicine Lodge city park. Seating that is set up around the area where the dancing is to take place is for the dancers, not the spectators, so bring your own lawn chairs. It is good to ask before taking a picture out of respect for those who may have religious reasons for avoiding photos. No one should ever enter the dance arena unless invited. Do not touch the clothing of any dancer. A good rule of thumb is to wait for the reaction of the Native onlookers. If they clap, then everyone claps. Most of the time the emcee will tell the audience what is going on and what to do. Food vendors will also be on-site providing the always popular Indian tacos and fry bread. There will be craft vendors selling a wide selection of Native items including shirts, jewelry, wooden crafts, rugs, wall decorations and Native items for children. Dances and the ceremonies with which they are associated played an integral part in the lifestyle of the Native American. 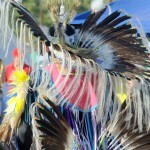 A dance was held to ask for help and direction from the Creator before a battle or a hunt. A dance was also held to celebrate joy or the victory of a successful hunt or war party. 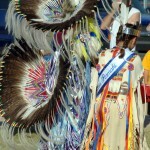 Dances, or powwows as they are now called, are still important occasions for the American Indian. They are occasions for keeping alive the traditions and cultural teachings of the those before them and passing them down to the next generations, in also making new friends and enjoying old friendships. 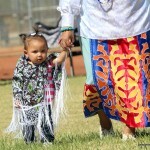 There are not many activities where a great-grandparent and great-grandchild may participate in the same activity as they may at a powwow. The word powwow is derived from the Algonquian term pau-wau, or pauau, which referred to a gathering of medicine men or spiritual leaders. European explorers who observed these gatherings pronounced the word wrong and passed on the wrong pronunciation to the Indians when they began learning English. The history of powwows is sketchy as there was a period of time when the gatherings were illegal under the United States Government. 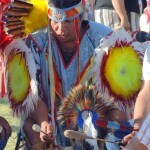 The modern-day powwow gives Native Americans an occasion to meet, dance, sing, socialize, honor their Native American culture and share their traditions with non-Indians. Planning a powwow can take months. 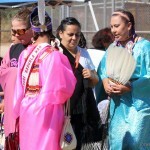 If a powwow or celebration is publicized, it is open to the public. Sometimes, it may be open to the public but there is a charge. In that case, it becomes more of an exhibition display. 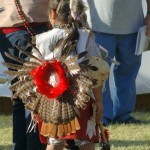 The Gourd Dance, which is performed at many powwows, originated many years ago among the Kiowa people. The Gourd Dance is a man’s society. It is enjoyed by the young men of the tribe; however, the gourd is not a veterans’ society. The men dance in the arena with the women dancing in front of the benches/seat of the men. The women never disrespect their men by dancing in front of them. The War Dance is a common dance among the various tribes. It was the original dance of the tribes among their social gatherings. 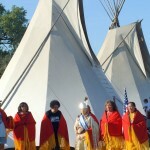 However it has had slight changes throughout the Native communities. 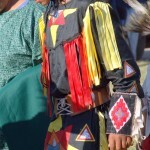 The fancy war dancing you will see originated among the Oklahoma tribes and is known as ruffle or war dance. They use two bustles in their regalia. 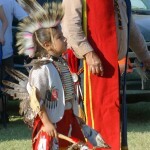 The Straight Dance or Gentleman’s Dance originated among the Ponca people and spread through the Oklahoma tribes and throughout the nation. They are trailing or looking for tracks/enemy in a display of a poise and methodical dancing. 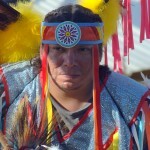 The Traditional Dance originated among the Northern tribes. They use one bustle on the lower back usually consisting of the eagle’s wings. 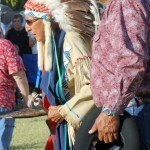 Depending on the tribe, the regalia may differ from man to man. Chicken Dance is a dance actually mimicking the prairie chicken. Originating among the Lakota people, it honors the prairie chicken with its dance given for it. 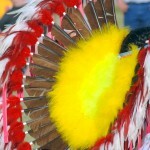 The Grass Dance also originate among the northern tribes. There are several stories of the grass dance. In one, a medicine man told a young boy to go to the prairie. There he saw the swaying of the grass and received a vision of himself dancing the same way of the grass. When he returned to the village and he shared this vision with his people, the use of his legs returned to him as he performed the grass dance. 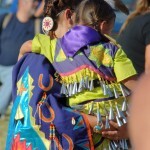 The Ladies Southern Buckskin is one of the most graceful and beautiful dances among the women. The beauty of the regalia and the timing and poise she dances with are truly something to witness. 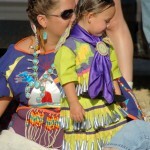 The Jingle Dress is a dance consisting of metal cones fashioned into the women’s attire. As they dance you will hear the rhythm and sound of their movement. The Fancy Shawl dance among the women is a colorful one. 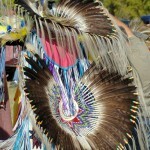 It is similar to the jingle; however, it is done with more emphasis on the display of of movement done with the shawl.